A tense game for two players who try to take the majority of coins of each number, from the ones spread across the board, by supporting the coins with personal pawns, dice, or pieces of their domino set. Everyone is welcome to comment on Google Drive or here. This is a fine, clean, two-player abstract game, and I highly recommend it. 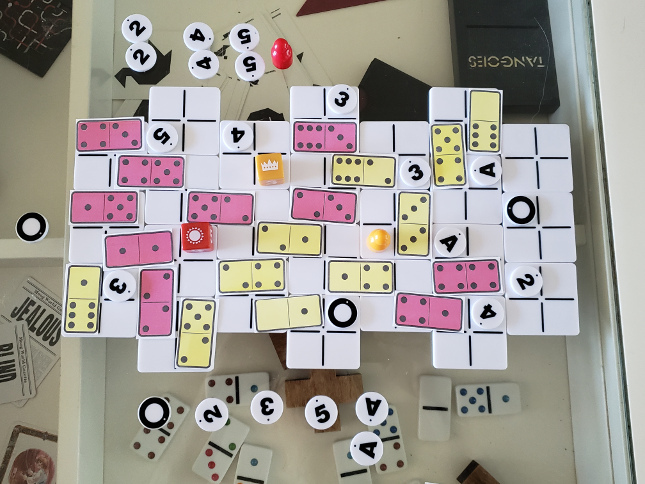 It combines the piecepack with two colors of double-six dominoes, which you might need to print and play if you don't have some on hand. Because this game is a port of Reiner Knizia's game Samurai, a fact that early drafts of this game obfuscated and the current rules don't make entirely clear either, it could never have been a winner of this contest, which is all about innovation (now, if it had been entered in Good Portsmanship, on the other hand...) Nevertheless, there are some sweet, innovative mechanics in this game, especially having to do with the dominoes and "support". Playtester Karl said he actually prefers Japan to the original. I probably do too. I'm giving this game an unofficial Bronze.